This exhibition is timed to celebrate the centenary of an unusually gifted and dedicated artist. Born in 1891, Margaret Morris was the daughter of the artist William Bright Morris. Her connection with the stage began when she was only three and she was regarded in London as an infant prodigy, Sarah Bernhardt offered to train her in Paris but instead she did ballet training at the Theatre Royal, Drury Lane, and later studied classical Greek positions with Raymond Duncan, the brother of dancer Isidora Duncan. But she wanted to expand the scope and expressive powers of ballet and she invented her own technique for dance and movement. By 1910, when she was only 19, her innovative choreography and dancing in Gluck's Orfeo at the Savoy were receiving rave notices and with help, she had opened her own Margaret Morris Movement school in St Martin's Lane. In the next two years she was touring her own company, had opened the first small theatre in London, was the first woman actor-manager and the youngest to have a Royal Court Season. 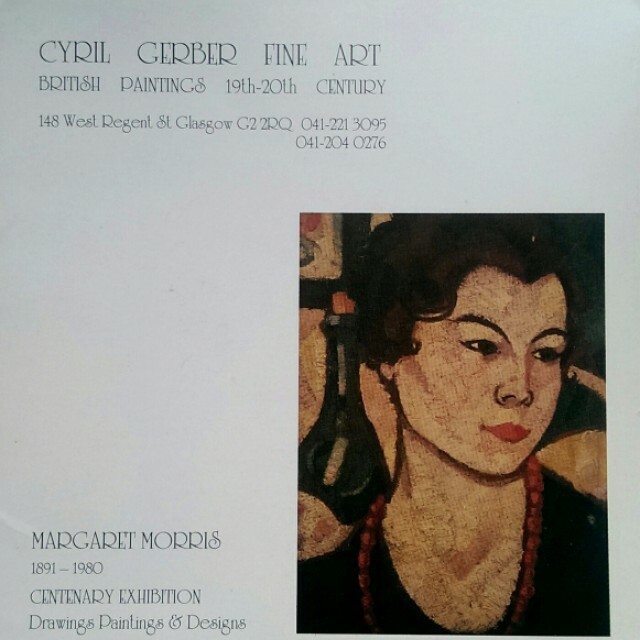 in 1913 during a tour in Paris she met the Scottish artist JD Fergusson. He became her husband in a creative partnership which lasted till his death in 1961. He helped her with costume and stage design and encouraged her to develop her own painting and drawing and to use other artists' work in her dance productions. Between the wars, Margaret Morris Movement schools promoting the unique form of recreative movement opened in Paris, Cannes, London, Manchester, Edinburgh, Glasgow and Aberdeen. Meg and JD's lives in the south of France and London brought them into close contact with a circle of creative people like Jacob Epstein, Augustus John, Peploe, Wyndham Lewis and Charles Rennie Mackintosh who designed a theatre for her which, however, was never built. On the outbreak of war in 1939 they returned to the UK and settled in Glasgow. Together they played a major part in forming the New Art Club and the New Scottish Group of independant painters. Morris founded the Celtic Ballet which toured Scotland and France and attracted the collaboration of indigenous painters like Crosbie, Herman, Macdonald, Bain and Taylor Elder as well as composers Erik Chisholm and Ian Whyte. In 1960 the company developed into the Scottish National Ballet. Morris was renowned as author of several books, biographer of Fergusson, choreographer, dancer, designer, physiotherapist, adviser to sports organisations and creator of the International Association of Margaret Morris Movements. It now has centres in 15 countries including France, Germany, Switzerland, Canada, Japan, Australia, New Zealand and the USA. At 81 she trained dancers for the musical 'Hair' in Glasgow. Margaret Morris was also a very talented painter and made many good drawings. The first attempt at a comprehensive exhibition of this aspect of her work did not take place until our exhibition in 1984. The present exhibition brings a further selection of paintings, drawings and costume designs to light for the first time.